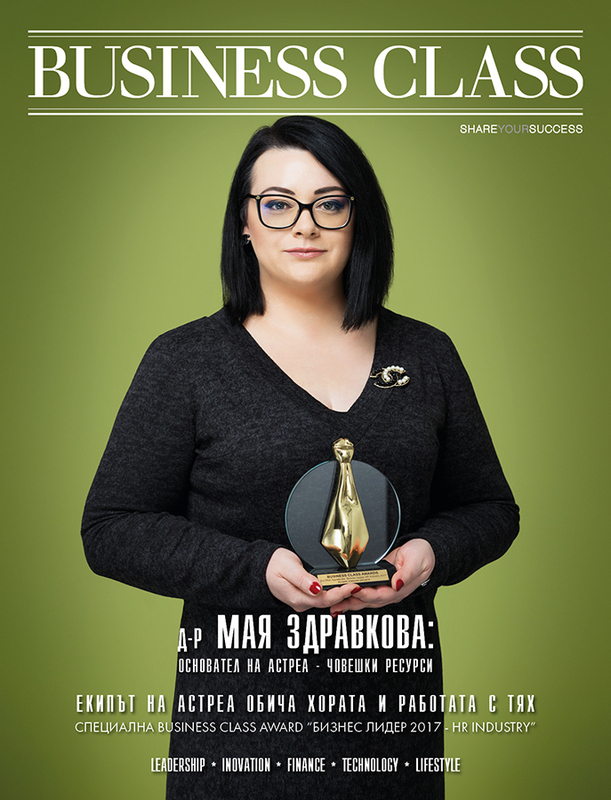 Miss Zdravkova, congratulations for your award “HR Business Leader”. How did your company become the biggest Bulgarian recruitment agency? Thank you for the recognition! I believe that being the biggest or best in something is a relative concept. To your question I can answer with one simple word “people”. The success we have accomplished in Astrea is because of the trust people put in us. And I don’t mean only the clients and candidates that we work with. Under the common denominator “people” I also put the employees working in Astrea. Teamwork is of exceptional meaning to us, Astrea’s team loves people and working with them. This makes the employees more committed to their work, more motivated, purposeful and therefore more effective. How did the competition in the consulting business has changed and what are Astrea’s advantages? Consulting business has always been a very dynamic and competitive sphere. We strive not to compare with our competition but to have an own way of business behavior. Of course, it is important to have competition, so we can have corrective when setting business goals and ideas. There are consulting agencies who are more advanced than us in some dealings, but there are also others who are way behind. I believe that there is balance and also a job for everyone who wants to be in this type of business. From the beginning Astrea differs with the individual meaning it gives to every client, no matter the material interest. I also think that reacting fast towards the client is a key moment in the services we provide. Is Bulgaria a good place for making business? During the past ten years, Bulgaria has had a dynamic development. There are a lot new investments and projects which have made the business environment in the country better. My personal opinion is that the most successful business model is Bulgaria as an outsourcing destination. Business located in the country which is selling its product or services abroad. Who is the good employee? The good employee is the one who loves his job. When one person loves his job he certainly becomes good at it. And always finds motivation even in the hardest moments. I would say that success is an abstract concept. Some say that success is equivalent of happiness – you’re happy, therefore you’re successful. For me, success is something we all strive to achieve, but each of us has its own definition for it. This is exactly why I say it’s an abstract concept. Churchill says that “success is the ability to go from one failure to another with no loss of enthusiasm”. For me that means that the failure is a feedback for the performance of a task, after which we move on. Failures teach us and lead us to successes in life. I think that a person has to learn and develop his whole life. And to share everything he has learned with the people around him. He has to have the ability of setting goal after goal. That’s why I don’t like the word “success”. It tells me that a person does something and then stops, but the successful person never stops. Because success isn’t an exact point in time. It’s not a result you get one time – like to set a record or win a golden medal and live on this your whole life. The pleasure of life is to live it every moment without stopping till the end. It is the same with success – the ability to move forward from one part of your life to another without stopping to dream and develop. Without stopping to be happy and appreciate everything that life gives you every day. Do you have time to relax and where and how you do it? I usually travel a lot for work and I get less and less time for resting, but I try to visit locations I like at least one weekend a month. That’s one of the things that helps me relax and charge me with positive energy. I like to travel in Bulgaria and abroad. As favorite destinations I can say Rodopite and Italy. When I don’t have time to travel I like to read and paint.